In one of the most emblematic and elegant streets of the city, in full heart of the neighbourhood of Gracia, you find this Guest House, which offers you an exceptional stay in a beautiful modernist building with friendly persons. Five stylish rooms offer comfort and privacy for our guests. 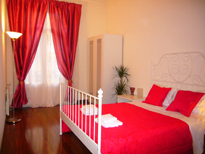 In your room you will find clean bed clothes, towels and a little gift. Also you have free Wifi in all the rooms and common zones. We offer you access to our fridge and microwave, a full and varied self service breakfast with juices, bread, cakes, cereals, cheeses, yogurt, jams, milk, various teas, coffee, chocolate milk, etc. All ours rooms have shared bathrooms. There you will find showergel, shampoo and a hairdryer. In the library you'll find guides and maps of Barcelona, tourist information and tips for nice and affordable bars, restaurants and shops. 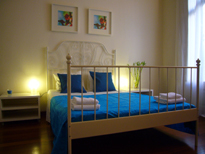 BBB-Jardinets is located in the Gran de Gracia street, at only 100 mts of the Avenida Diagonal. From our house you walk in 5 minutes to the Pedrera / Casa Mila and 10 to Casa Batlló, both master pieces of the modernistic architect Antonio Gaudí. In just 15 minutes you walk to the Sagrada Familia, another of his master pieces or the the famous Ramblas. Just crossing the street you'll also find little squares with restaurants, cafes and shops, ideally to relax after a full day in our charming city. On just 50 meters there are the busses 22,24,28 (to Parc Guell and Plaça Catalunya) and after another 50 meters you can enter in the metro lines 3 (green) or 5 (blue), connecting you to all thre rest of the city!